I got into a discussion this past weekend with Mikey and his cousin, Danny, about candy corn. 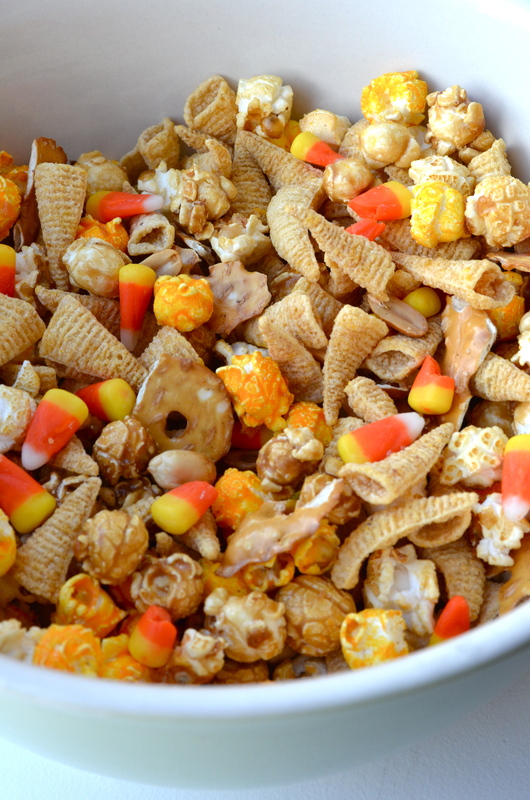 It all started when I pulled out this bowl of Witches Brew and they commented on how candy corn is only good when combined with something salty, otherwise it’s gross. I fought them on it for a while (I’m stubborn) and tried to convince them that they taste like marshmallows because really they are only made of sugar and food coloring (another fact they didn’t believe). They then went on to say that the candies don’t even look like corn, which was when I brought up the pumpkin shaped candy corn (still bad according to them but I think even better). I always loved the pumpkin candy corn the most for a few reasons. A. They were bigger. Bigger = more sugar, duh. B. 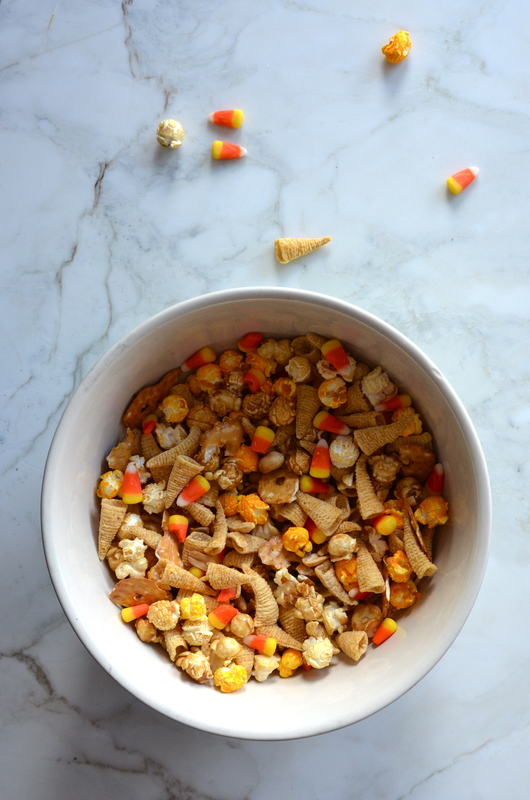 You could bite the green tops off first and that’s super fun (although with regular candy corn you can eat it in 3 bites/colors, also fun). C. My grandma always sent them to us/had them at her house so they evoke great memories of her which makes everything taste better as well. This brings me to another factor within this delicious and thought-out combo of Witches Brew…Bugles! Mikey was golfing with a friend about a month ago and he brought him lunch, which included a few bags of Bugles. Ever since then, Mikey has brought up Bugles and how great they are at least twice a week. I obviously had to include Bugles in this mix and boy am I glad I did. It lead our group of friends into quite the hilarious discussion about this underrated snack food. I too have to agree that yes, they are indeed very salty and delicious. They are fun because you can put them on your fingers like a witch and (this is just me apparently) they taste “cold” when you bite into them (Probably from all the saturated fat/oil in them). Who knew this Witches Brew could bring up so much conversation?!? The last couple nuggets I want to share about this yummy mix is that you can ALWAYS switch ingredients to make it your own. 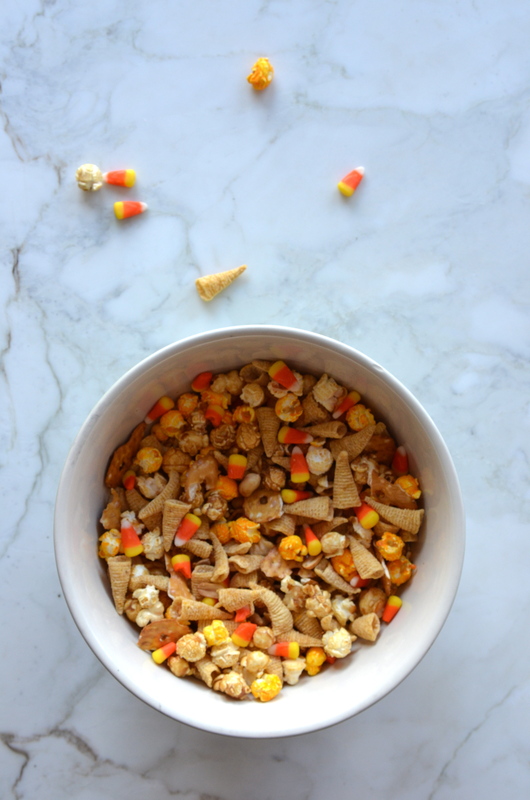 For example: Candy corn with just salted peanuts is a dream come true. Think a fluffer-nutter sandwich. 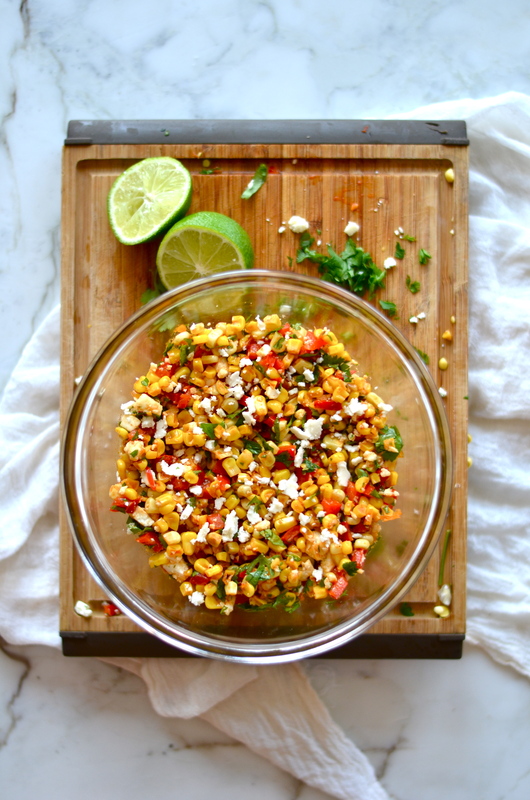 You could do regular popcorn instead of (my favorite) Chicago mix popcorn. If you’re not familiar, let me change your life. It’s cheese popcorn mixed with caramel popcorn. If you ever get a chance to try Garrett’s Chicago Mix popcorn, you MUST MUST DO IT. Your life will be forever changed forever. That is all I have for you on this wildly exciting snack mix. The sky is the limit when it comes to flavor combos in this mix. Sprinkle it with melted chocolate, add any chip or pretzel flavor of choice. We added chocolate covered pretzels by the end of the night and that was great too! 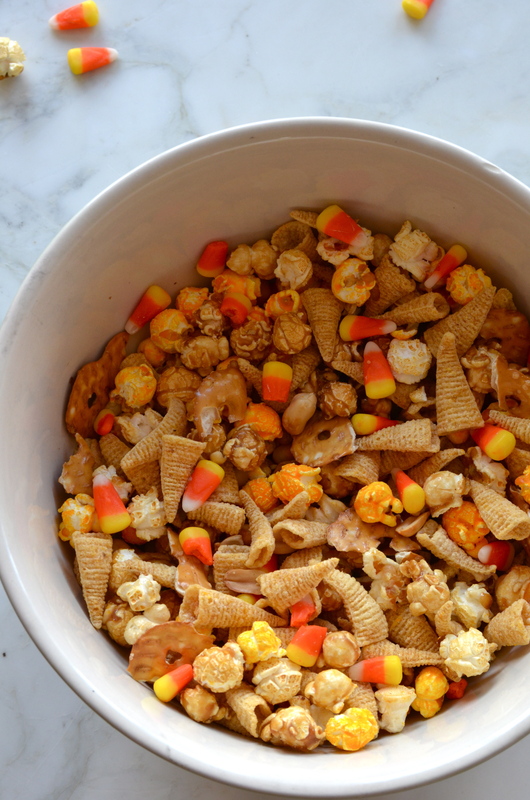 Whatever you do, throw together a batch and watch it quickly disappear (or notice what people pick out of it first, probably the Bugles, and then just add more of that next time). It really feels like fall today in Chicago! I don’t really mind the cozy rain and cooler temps to be honest. I feel blessed to have enjoyed so many warm fall days so far this year so I won’t complain. Plus, I can’t wait to see all the cute kids dressed up and trick-or-treating this weekend for Halloween! This would be a super fast, easy and fun “craft” to make with some kiddo’s as well. 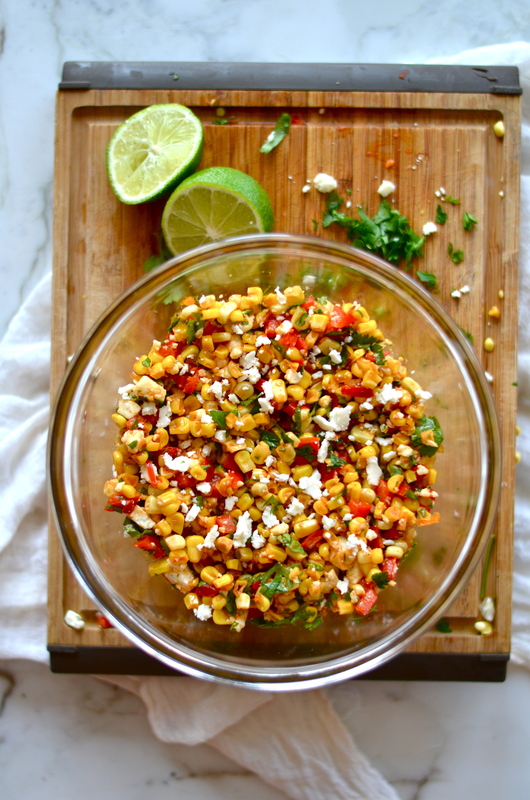 Have them pour all the different ingredients into a bowl and stir it up! 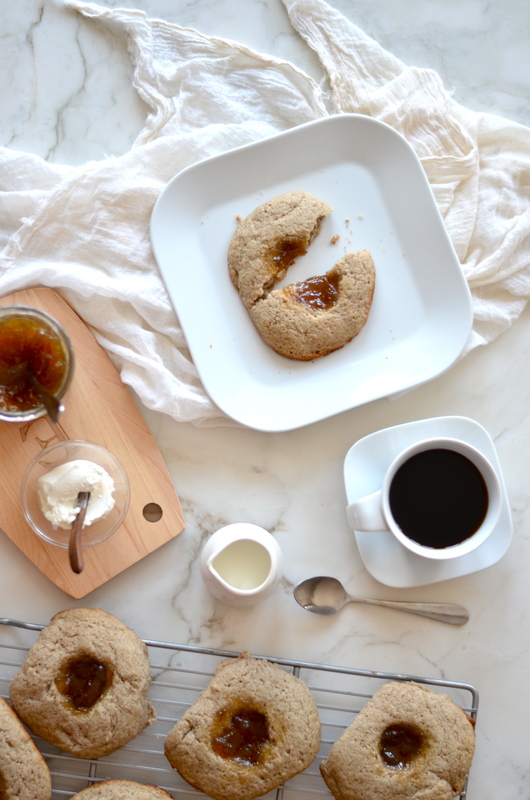 Or make this hump day a little better and make yourself/friends/office an afternoon snack! Combine all ingredients in a large bowl and gently toss. Serve and enjoy! I think a detox salad is in order. After finishing my 3 day juice cleanse last week I did really well until the weekend came and then I fell off the wagon. I was up at my parents house in WI, what do you expect?! I needed to eat cheese curds, beef sticks and drink delicious beer. It’s what you do there. After having an awesome weekend I am back on track to some healthy foods from the earth. Simple to prep and so tasty and satisfying. 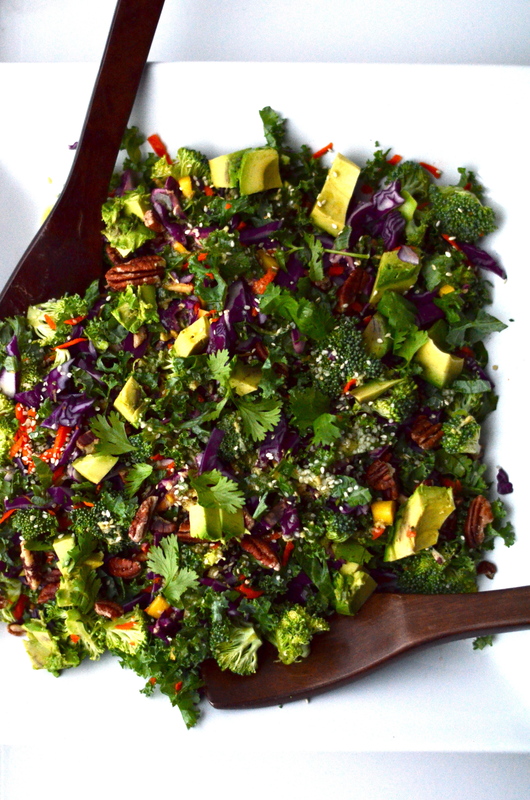 This salad will honestly boost your energy levels. You will feel super energized and like you are ready to carpe freakin’ diem! You can always sub out any veggies or nuts/dressing ingredients that you don’t like. 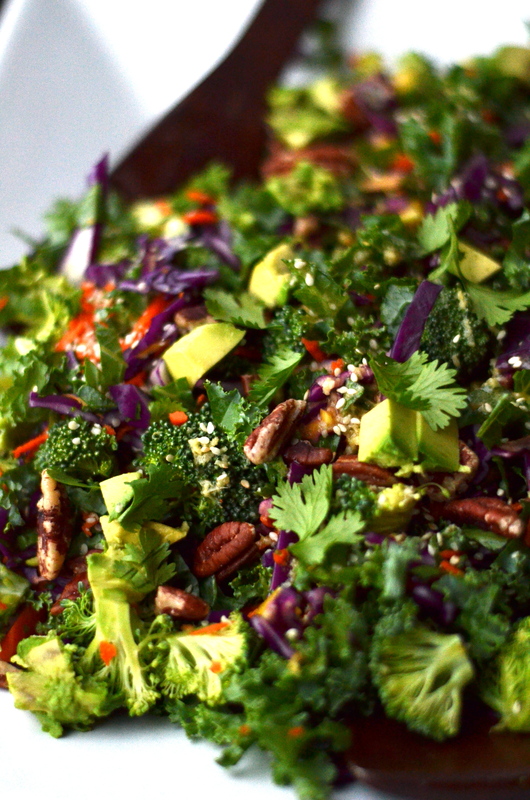 I love to add tahini do my dressing as well for a bit more of a nutty flavor. Check out Norman in the picture below (and also at the very bottom). He is ALWAYS trying to photo bomb my pictures. I typically stand on a chair/couch/table on one foot using the other foot to try and block him from deep-diving into my food. I literally don’t know how else to teach a cat to stay off the table and counter. I yell, chase, spray, smack and make every single other sound and motion humanly possible to try and scare him and he just stares at me like I’m a crazy person (he’s not wrong). But, he is my fur baby and at times I will give him a scrap or two (unlike Mikey who thinks that everything he eats needs to be shared with Norm). I follow my Mother-In-Laws suggestion and try to get as many colors on my plate and into my diet every day. 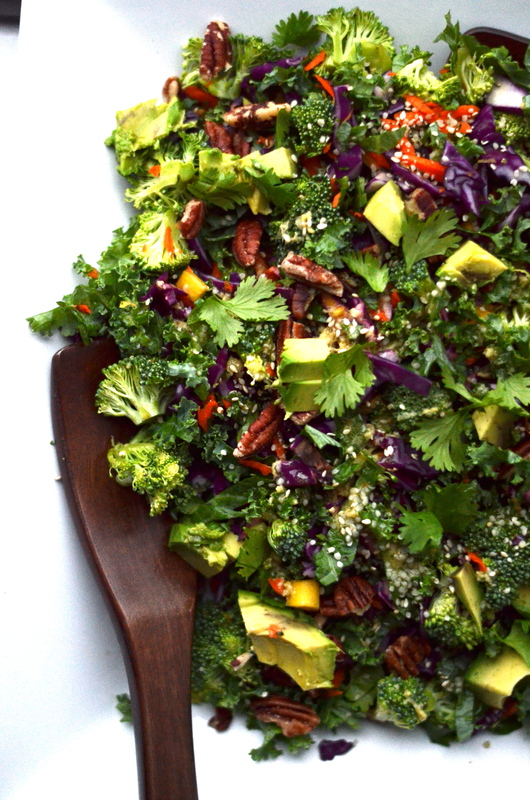 This salad is no slouch and has so many colors and nutrients to leave you feeling healthy and ready to take whatever the world wants to toss your way! Hope you’re all doing amazingly well. Sorry the Lately post’s have been M.I.A as of late. I teach a yoga class Friday mornings now so my routine is a little different and I am still getting in to the swing of things. I promise to try my hardest to keep those babies comin ‘attcha as often as I can! Happy hump day and, oh yeah, GO CUBS GO!!!!! Corn is my favorite. The only time I met a corn dish I didn’t like was the time it was in my ice cream. I’ve tried it like, 3 times. I can’t do it. This salad, however, is the thing dreams are made of. Plus, it’s spicy. Sriracha is one of my favorite flavors/spices. 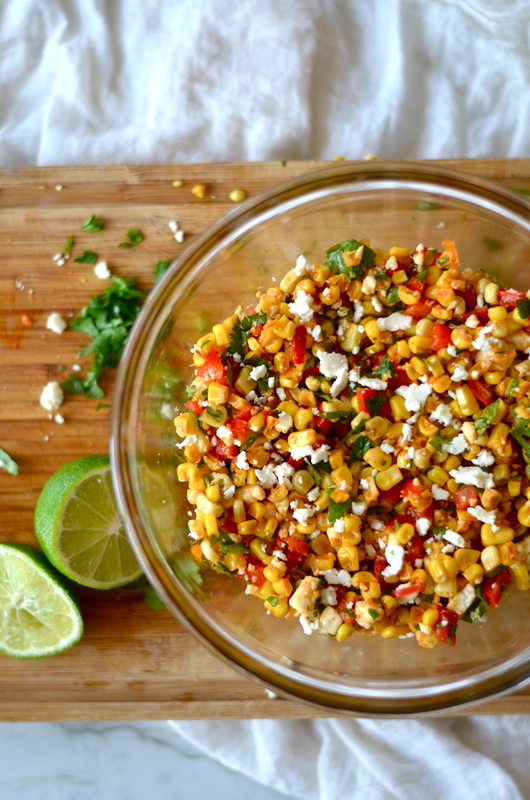 The salty and sweet Cotija cheese is a delicious addition and the corn is fried up to perfection. But until I hibernate, and now that I’m a year healed from the lip fiasco and can eat solid foods again, I am back on my corn game (I was never really off of it. The “incident” couldn’t keep my love for corn at bay). 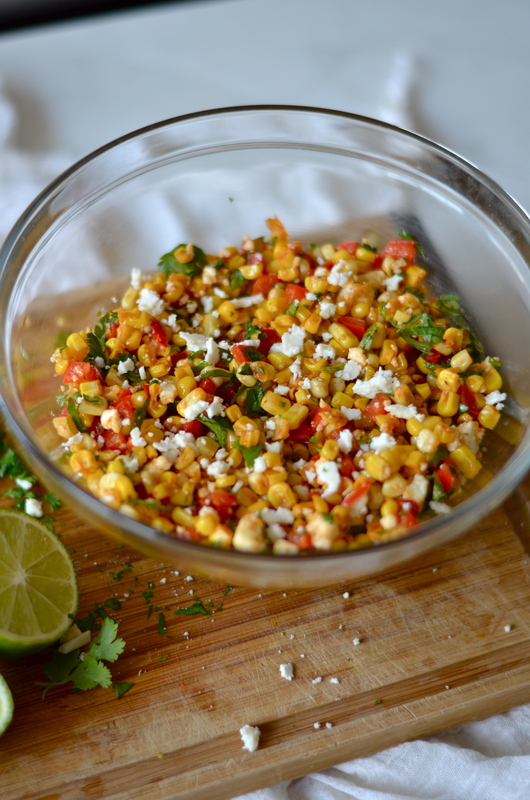 This is an amazingly easy and TASTY corn salad that I could eat in one sitting by myself easily. It’s quick to make and could be adjusted with other herbs, spices and veggies to taste. You can serve it warm or cold and it honestly packs a punch from all the Sriracha. We loved it. 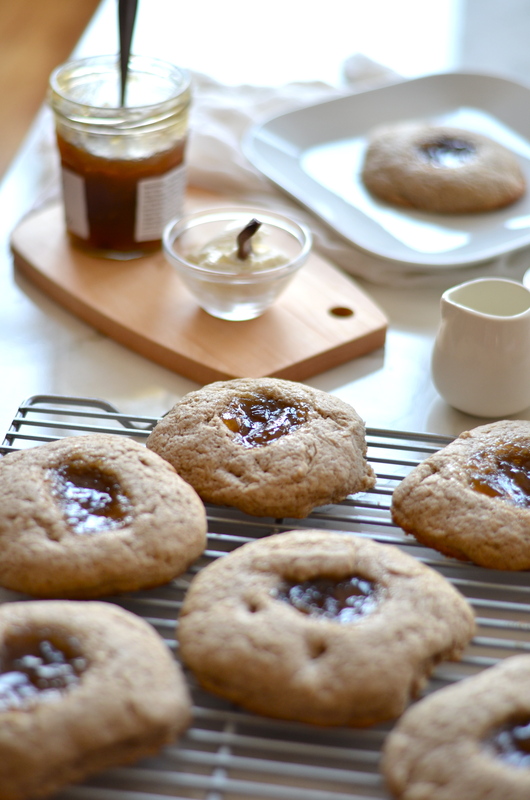 I discovered this recipe on food52, one of my favorite places to find recipes as well as beautiful gifts and interesting articles. There is nothing better than pretty food and great lighting for taking pictures. I made these scones and the lighting was absolutely perfect. I had a SUPER hard time choosing what pictures to use and which to toss…so I just used a bunch of them. I hope everyone enjoyed their long weekend! I know I did and am now ready for a full on detox! It is still crazy hot and humid here and I will admit I am ready for some fall weather. I heard on the news that the Pumpkin Spice Latte at Starbucks is back today…that means it’s fall now, right?! The best scone I have ever tasted was when I lived in London. We went to afternoon tea at the Orangery at Kensington Palace. They brought us the most delicious scones with clotted cream and jam and I was in heaven. Everyone was dressed beautifully and I felt so fancy. I had never even had a scone before then and that was where I fell in love. Any item that serves as transportation for clotted cream or jelly is a favorite food of mine! 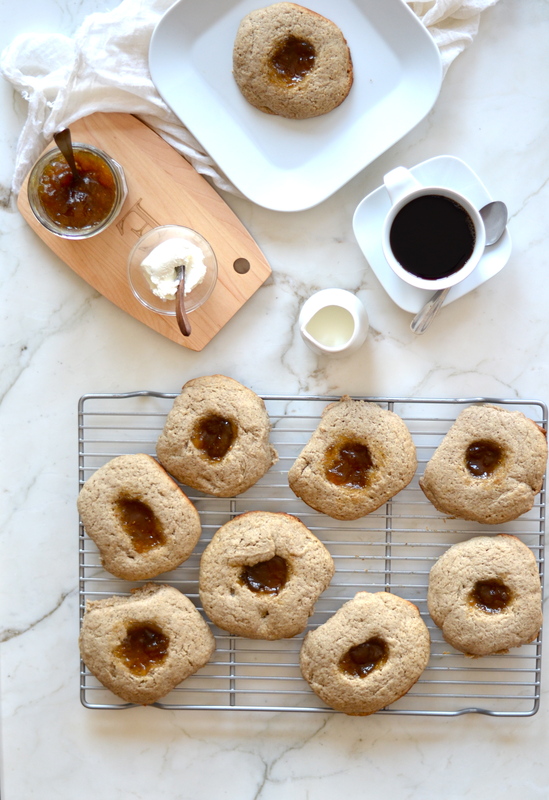 I was inspired to make these particular scones because they serve a version of these at my favorite coffee shop in our neighborhood. It’s called La Colombe. 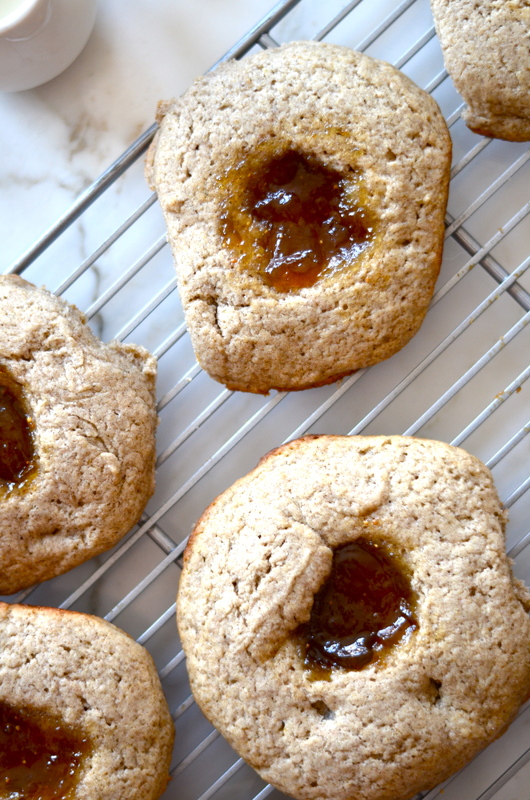 They are slightly sweet and salty and they go so well with your coffee! 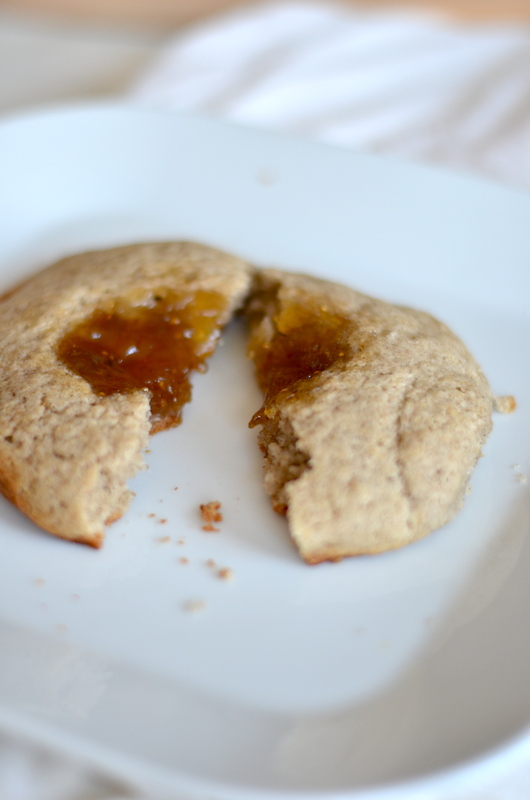 I would add a slight sprinkle of coarse sugar if I were to make these again. They were perfect when served with some extra jelly and cream cheese. 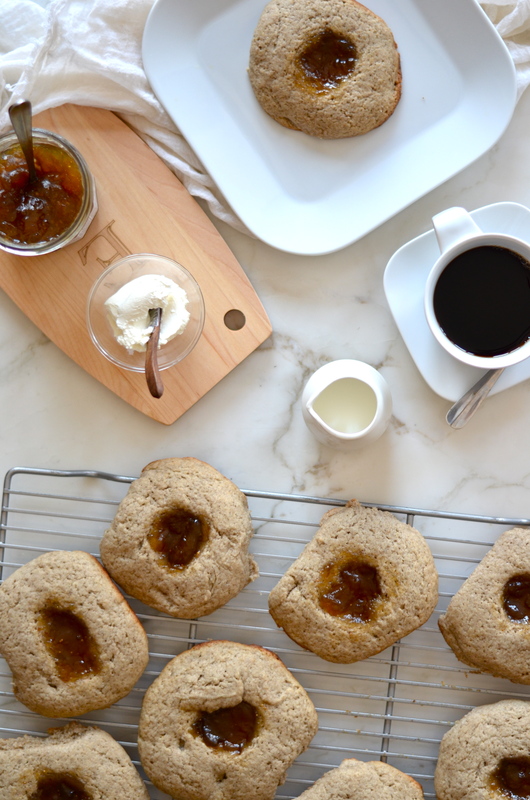 Scones seem like a fall brunch/snack to me so since I woke up feeling ready for some cooler weather this seemed like a fun recipe to share with you today (instead of a detox salad). 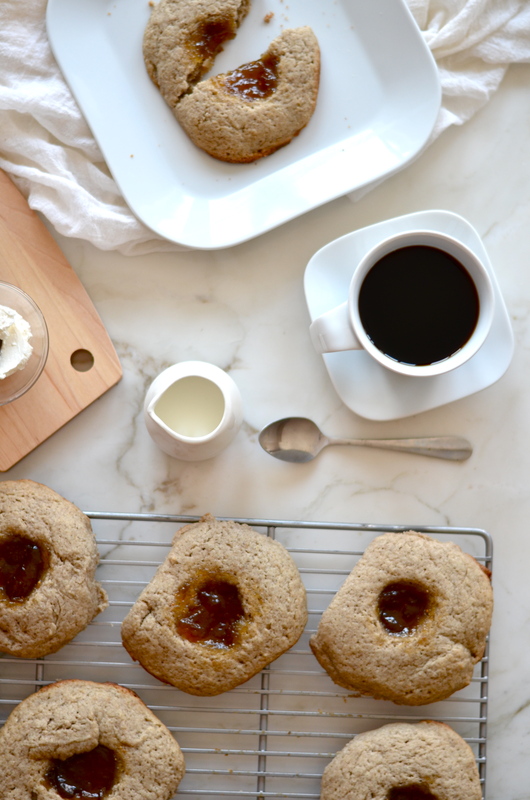 Enjoy this shortened week, and maybe plan to make some scones this weekend and relax with a cup of coffee and some friends! 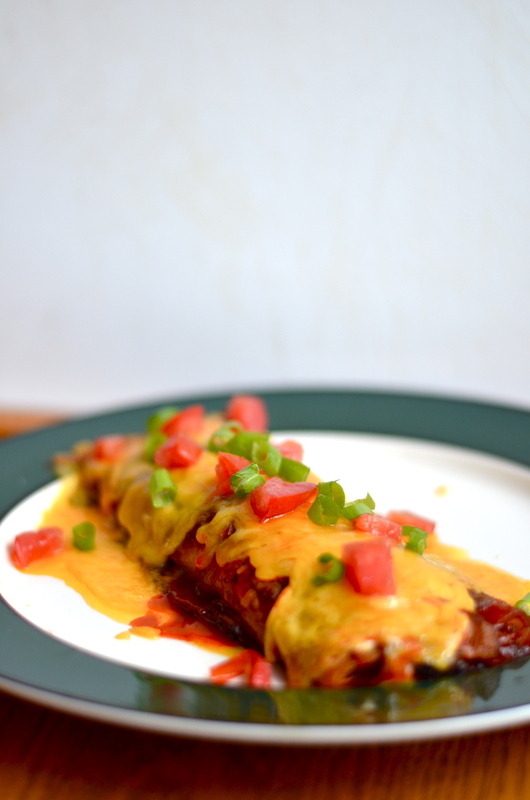 I shared my homemade enchilada sauce with you a little while back and here are the enchiladas to go with it! 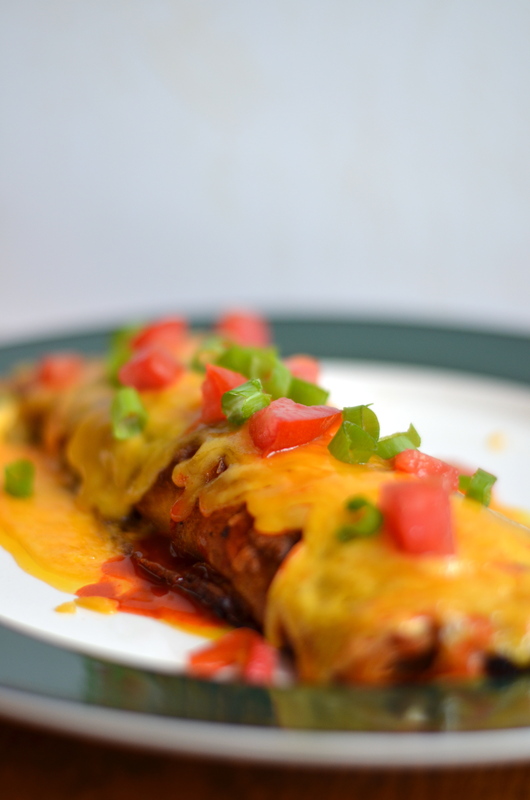 These enchiladas are a bit different in that they have a sweeter pulled pork recipe inside them. You can add and subtract as many ingredients as you want in order to make them just the way you like! 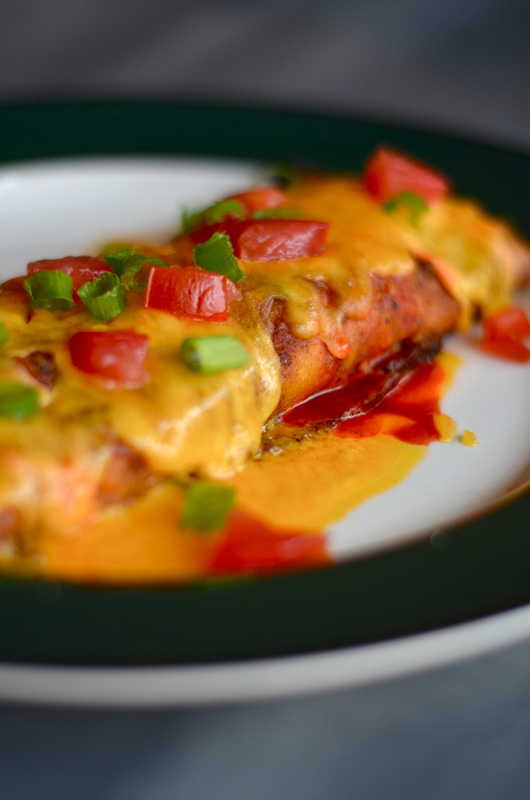 I thought this was a fun change on a typical enchilada but I will be honest and say that I prefer a classic flavor to this. I work in the BBQ sauce industry so these reminded me a bit more of a sweet BBQ than the typical smoky/spicy kind. 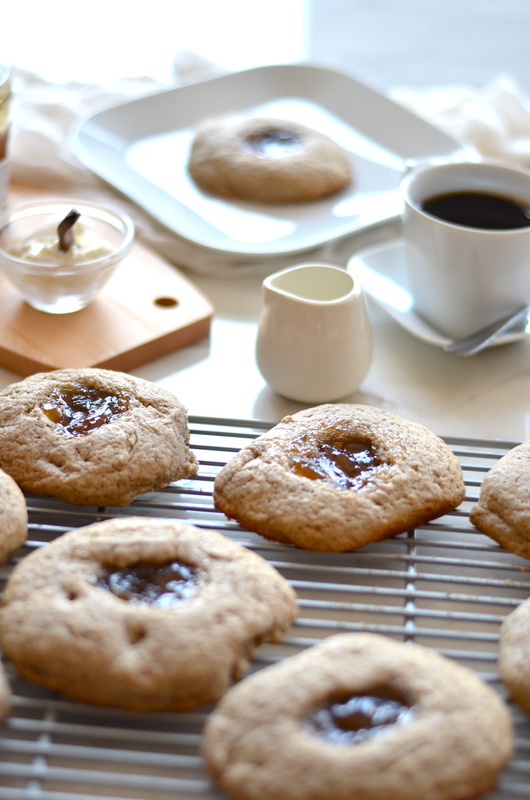 I sometimes love to mix up the normal recipes we make and this was definitely a fun experiment. The meat was sooooo good, and could have easily been used to make a pulled pork sandwich! The other thing that is so fun about this recipe is, as I mentioned, how you can add and subtract ingredients to fit it to your needs. 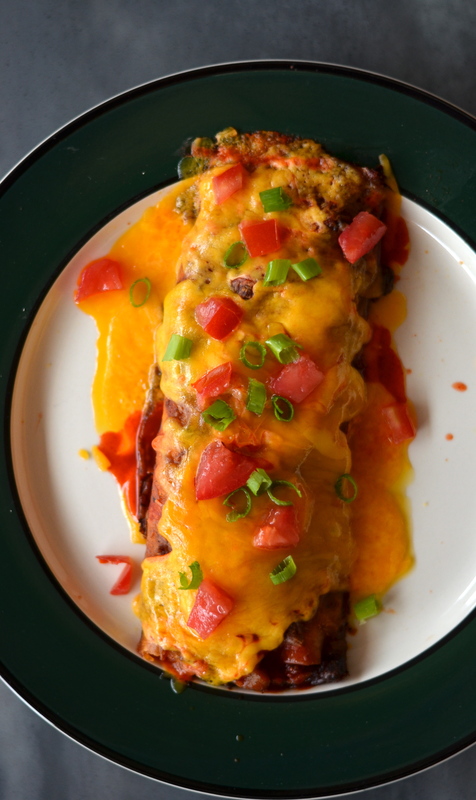 I added black beans but you could add any type of bean or rice to the inside of these enchiladas. You can sub pork for beef or chicken if you like that better as well. The best part about Mexican food is definitely the toppings. 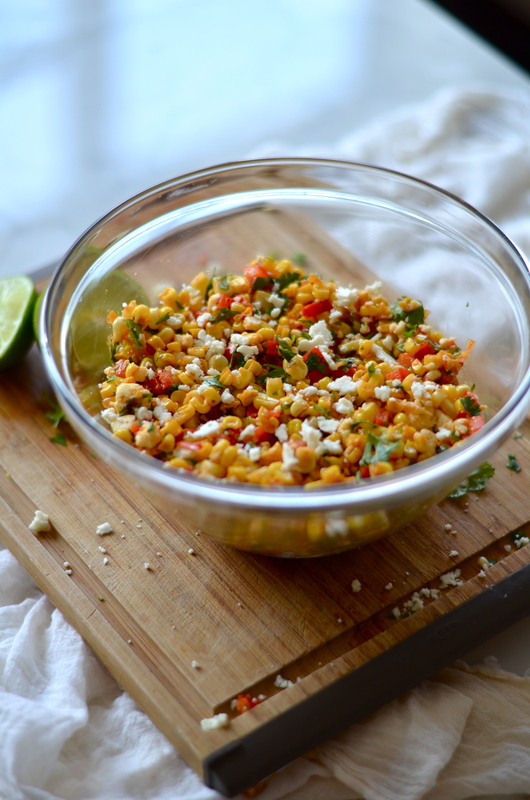 Here are just a few ideas…Hot sauce/salsa, onions (yellow, white, red or green), olives, tomatoes, avocado, cilantro, different types of cheese…the list goes on! 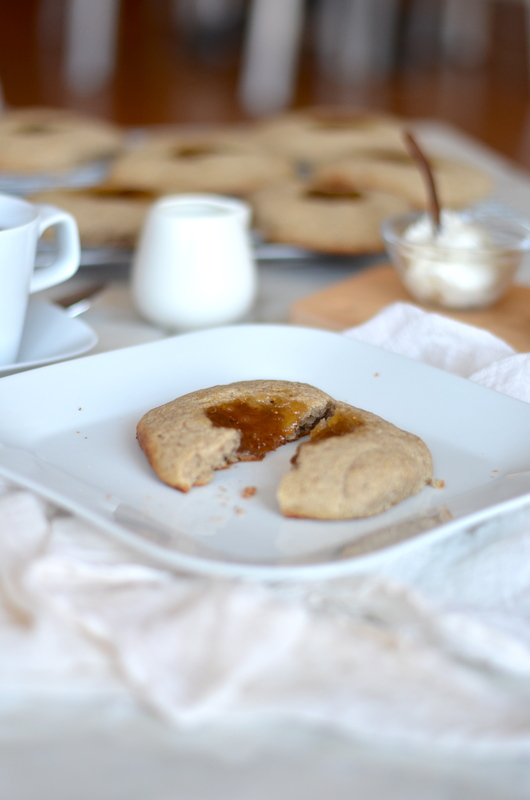 I hope this recipe helps you get through your hump day! I am looking SO FORWARD to the long, Holiday weekend! I have a super exciting announcement to share with you next week and I CAN’T WAIT TO SHARE IT WITH YOU! Have a great week and good luck staying cool in this scorching weather that showed up here in the Midwest!